Leo Durocher (1906-1991) was baseball's all-time leading cocky, flamboyant, and galvanizing character, casting a shadow across several eras, from the time of Babe Ruth to the Space Age Astrodome, from Prohibition through the Vietnam War. For more than forty years, he was at the forefront of the game, with a Zelig-like ability to be present as a player or manager for some of the greatest teams and defining baseball moments of the twentieth century. A rugged, combative shortstop and a three-time All-Star, he became a legendary manager, winning three pennants and a World Series in 1954. Durocher performed on three main stages: New York, Chicago, and Hollywood. He entered from the wings, strode to where the lights were brightest, and then took a poke at anyone who tried to upstage him. On occasion he would share the limelight, but only with Hollywood friends such as actor Danny Kaye, tough-guy and sometime roommate George Raft, Frank Sinatra, and his third wife, movie star Laraine Day. 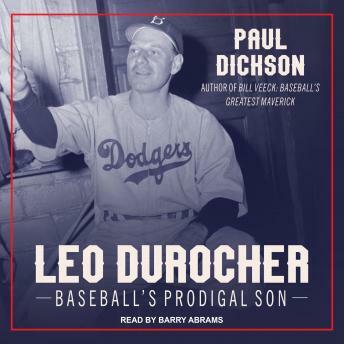 As he did with Bill Veeck, Dickson explores Durocher's life and times through primary source materials, interviews with those who knew him, and original newspaper files.